Whenever this minion takes damage, deal 2 damage to the enemy hero. Once a lowly "Stick Flinger", he's been relentless on the path to his ultimate dream: "Tauren Flinger". 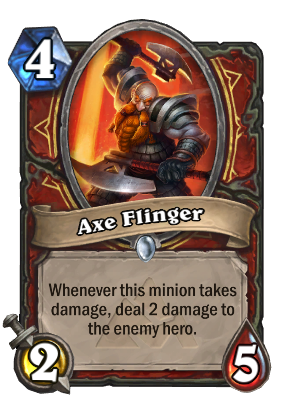 Though not the best card I have large place in my heart for Mr. Axe Flinger. He can really get a lot of value if you normally get 2-3 procs of his ability. Plus if he is attacking to get the procs you're doubling his damage. It's almost like he has windfury in a way. Getting around 8-12 damage off a 4 cost minion is pretty great. Sadly however this all happens over the course a few turns which does make him very slow. Being a 2 attack minion also has a lot of draw backs also and can be easily countered. Facing a priest who just stole you're flinger is one of the worst things. The 4 mana slot is super competitive and I think Flinger does fall short due to his speed, but if you can maximize Axe Flingers value he is a great tool and can swing you games. Axe Flinger + Bouncing Blade = 7 Mana 10 Dmg to the opponent's face. Does Axe Flinger Commanding Shout Bouncing Blade combo kill your opponent??? Madder Bomber, it's time to troll. Did someone say bomb? Face warrior could be making a return. We already have some very good tools and Blackrock mountain seems to be filling the gaps. we Have the 1 mana 0/2 Whelp egg turn 1. Turn 2 Inner rage / Cruel taskmaster for a 3/1 2/1 and a 2/2. We have some decent other 2's 3's and 4's, in the Firey win axe, Frothing Berserker, Deaths bite etc. And now we have our power hitter who syncs well with Inner rage Taskmaster, Whirlwind, a turn 4 Deaths bite and Inner rage as a great finisher. Don't you mean 2/1, 2/1, and a 2/2? Needless to say, I think that would be an incredibly strong opener. Yeah, +1 for more options :D Also... more dwarves!